Cost – £10 on the door £8 in advance. On-line advance tickets sales close 3pm Saturday. B Beats are back with a sting in their tail! For one night only, we bring you BUZZ – a frenetic hive of beats and bass that will have you buzzing all weekend! 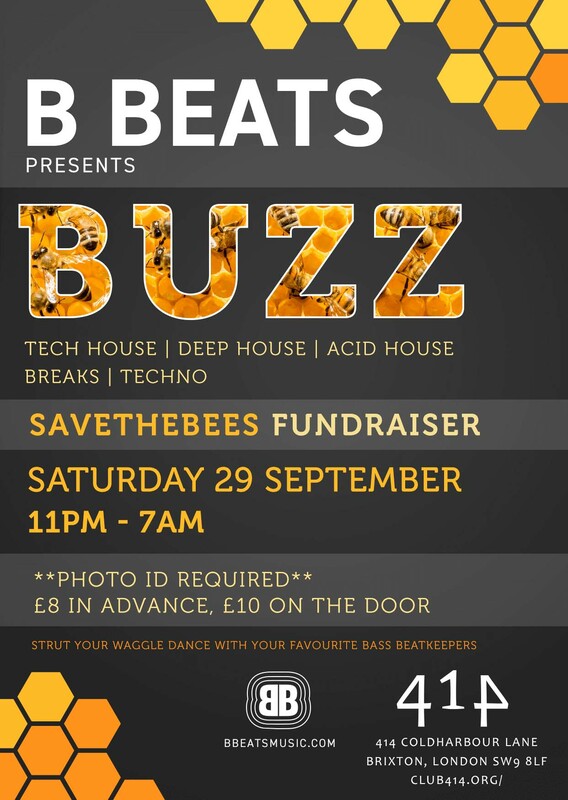 This one’s a special night as we’re raising money to SAVE THE BEES, so dig deep and show love. Your favourite beatkeepers will be joined by our guest DJ drones to to bring you the full range for your electronic aural experience. Beloved rave brothers and sisters, bound by the letter B, from Brixton to Brighton and back again. In bass we trust. Bass in your face house and stinging breakbeat. Honey smooth, deep house grooves. Queen bee of acid house and techno. His nectar of beats gathers swarms on the dancefloor. Get buzzing with house that’s juicier than a fruit salad chewit. He’s earned his stripes representing the house and techno vibes. Campaign and ticket details to follow. On-line advance tickets sales close 3pm Saturday.